After working with filmmaker James Gunn on his first two directorial efforts, Slither and Super, Michael Rooker makes his Marvel Cinematic Universe debut as Yondu in Guardians of the Galaxy, opening in theaters August 1. While he's not one of the Guardians themselves, Yondu, an outlaw leading a team of miscreants known as The Ravagers, plays a critical role in this Marvel Cinematic Universe: Phase Two adventure. I recently had the chance to speak with Michael Rooker about the extensive commitment it took to just apply the makeup for this character, how filmmaker James Gunn's style has been altered (if at all) to build this immense sequel, and much more. I read that you were worried that your schedule on The Walking Dead would conflict with this. That must have been an odd position to be in. Michael Rooker: It totally did. It totally conflicted, and it was like, 'Oh my God,' and we realized that I can't do Yondu, because I can't do this bigger role. We decided on a smaller role, but then, I found out that I'm gonna die in The Walking Dead, so everything worked out. It's this whole complete turnaround. How perfect. Perfect timing. It worked out great. That's awesome. I love how Yondu always throws it in Peter's face that he's his savior. You don't see how important that is until the very end, but did you develop a backstory about why Yondu did what he did? Michael Rooker: He's got balls, man! The kid, right off the bat, was a fighter. That's Yondu. He likes all these little things, and this is this little kid, and he's tough, you know. It's like, 'Wow.' I say that all my guys want to eat him, but he keeps him for himself, and raises him as his own, and teaches him how to steal and cheat and rob (Laughs) and get what he wants. He does it to me as well, and I think Yondu, I think, feels proud, as a parent, that this little guy is willing and able to take from me. If you can take from me and steal from me, you're gonna make it. You're gonna make it, man. You're gonna make it in life. Yeah, because it seems in that last scene, that he's glowing with pride. You mentioned all the knick-knacks he has, and there's that line where the shopkeeper says, 'I'm not sure if you're joking or not.' Is there a reason he has those things, or is it just one of his eccentricities? Michael Rooker: You know, it was just a little eccentricity, to have these little trinkets and doodads. It's kind of fun. It's the little things in life. I really loved the spear weapon that he had. Michael Rooker: Oh, yeah. The arrow. Yeah. Was that something that he stole, or that he created? Michael Rooker: That's part of the original Yondu, from 1969. He used a bow and arrow, and he used this whistle to direct it. That's the arrow, and so with the ability to redirect it, through my whistle, it's like, 'Why do you need the bow?' If you can make it go wherever you want it to go, there's really no reason to carry around this bow. So, it's modern, it changes it up quite a bit, but it's good. It's very powerful. That scene at the end was just brilliant. Michael Rooker: Wasn't that great? You saw him threaten people with it, but I was wondering if we'd ever see that in action. When we got to that scene, I was blown away. It's one of my favorite scenes in the movie. Michael Rooker: Oh, thank you! Michael Rooker: When they first did that, people were clapping. The entire theater started clapping. I don't know if you guys clapped when you saw it, but people clapped through it! Because it happens so fast! Your time is extended, because you want to see what happens, but, in reality, it happens in the blink of an eye. And, the ability to see the individual in the ship. To actually hit the individual in the ship. It could have just went through the ship, right? But, there must be something about Yondu, that he has these abilities to see things. To see the target, maybe. Can you talk about how extensive the makeup and the prosthetics process was? Michael Rooker: It was really cool. The prosthetics and the first part of makeup was maybe like an hour, hour and a half, whatever. Then another hour or hour and a half or so. I have a little break for a bite to eat, then I go into the paint room and stuff, where they did all the airbrushing, adding all the different colors and all that stuff. That took another hour and a half or so, then I did wardrobe, and it all ended up being about five hours, before being camera-ready. I was ready after about five hours or so. Wow. It seems like almost everyone had to go through that, though. Michael Rooker: Everyone did, yeah. Dave (Bautista) went through even more. He had to stand up for a lot of his. At least I got to sit down, every now and then, nod off (Laughs). I read that (composer) Tyler (Bates) actually composed parts of the score for you all to listen to on the set. Was that a different experience for you, and did that help inform the character? Michael Rooker: It's just cool, it's just fun. It just gets people in the mood. You know what it is. It makes you want to dance, or sit back and relax. Is that something that James has done on his other movies? Michael Rooker: Oh, yeah. He does that. He did that with Super. A lot of directors do that. A lot of actors do that. They'll be on their headphones, listening to music and stuff. It gets them ready, and where they need to be. You were in James' first two movies, but how cool is it to see him have this huge sandbox to play in? Michael Rooker: Oh my gosh, it was an awesome sandbox! And he got to invite all his friends, you know? The cast is great, big cast, and we're all playing in this sandbox together. It's crazy. It's awesome. Was his style altered, in any way, because he has so much more to work with? This didn't seem like a movie where you were standing in front of a green screen the whole time. Was there a lot you did in camera, or was there still a lot you had to do with a green screen? Michael Rooker: Dude, we had a green screen that was as big as a football field. The green screen was the entire, oval, 360 degrees, curtain of green, all around us. Some of those scenes from these worlds, it was all green screen. Then we played from the green screen, and we had these practical props and dwellings, big rock formations in everything, within the green screen environment. We almost always had some sort of practical element as well. That's my time. Thanks so much, Michael. Michael Rooker: Pleasure is mine, man. Thank you! 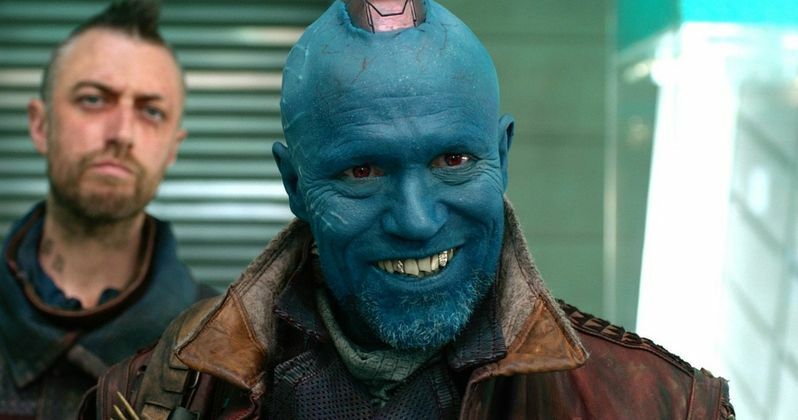 Check out Michael Rooker as the blue-skinned Yondu in Marvel's Guardians of the Galaxy, in theaters nationwide August 1.